Pragma�s Wooden Simple Base bed frame features a strong, flexible mattress support system that eliminates the need of a box spring. 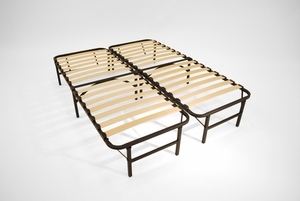 The sturdy steel frame is combined with beautiful birch wood slats to provide durability as well as comfort.. Pragma�s Simple Base bed frame accommodates all mattresses, including therapeutic memory foam, conventional innerspring, air, or latex mattress for a firm, squeak-free sleeping experience. Pragma�s Simple Base features a lightweight, foldable design, offering easy transportation and storage. It requires no tools for assembly and sits 14 inchess off the ground. The Wooden Slat Base is available in all sizes. Dimensions for each option are listed in the �Specifications� section. � 13� clearance under entire frame provides space for available storage bins. � Sturdy steel frame combined with birch wood slats for flexible support. IMPORTANT NOTICES: Assembly required. Mattress not included.